* Adjustable for volumetric changes during healing. * Hook and loop straps maintain soft tissue compression . * Available in standard "Long" models in left and right configurations or universal that fits left or right. 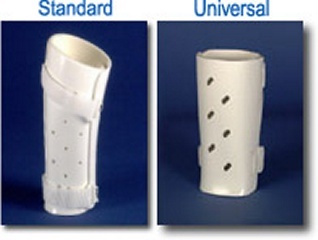 PRODUCT DESCRIPTION: This comfortable lightweight brace is designed for the management of mid-shaft and distal ulnar fractures. The anatomically correct design achieves total contact circumferential soft tissue compression for optimal control of ulnar segments. Full range of wrist and elbow motion is permitted to prevent problems associated with immobilization, increasing vascularity and encouraging bone growth. Two unbleached cotton stockinets are provided as an interface and to act as a wicking agent.